The next international crew destined to live aboard the space station, including the first Canadian that will command the complex, flew to the Baikonur Cosmodrome on Thursday to begin final preparations for launch. Chris Hadfield from the Canadian Space Agency, NASA's Tom Marshburn and Russian cosmonaut Roman Romanenko jetted from the Star City training facility outside Moscow to the launch base in Kazakhstan as their Dec. 19 blastoff aboard Soyuz TMA-07M nears. All veteran space fliers, Hadfield and Marshburn were former space shuttle crewmembers and Romanenko was aboard the station as its resident team doubled to the full six-person size. Their launch is planned for 1212 GMT (7:12 a.m. EST) on Dec. 19, rocketing into orbit atop the three-stage Soyuz booster in pursuit of the station for docking Dec. 21 at 1421 GMT (9:21 a.m. EST). 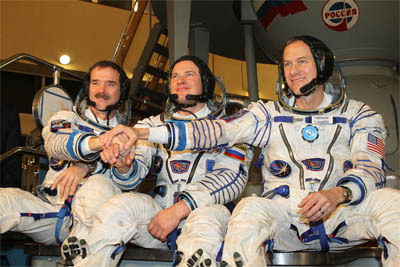 They will merge into the existing Expedition 34 crew of commander Kevin Ford and Russian cosmonauts Oleg Novitskiy and Evgeni Tarelkin, working alongside with them through March 15 when that trio comes home and leaves Hadfield, Marshburn and Romanenko to create Expedition 35 for the rest of their tour-of-duty that extends to May 14, for a total launch-to-landing mission duration of 146 days. It will be in those final two months that Hadfield assumes control of the International Space Station, becoming the first Canadian commander. "For Canada, I am their very first spaceship commander. It is an affirmation to my country, from the trust and the respect and the capability Canada has on a world stage and a real cutting-edge technological stage and something in the human experience that is in a parallel of the great explorations, the first explorers that created Canada as it is," Hadfield says. "It is a big event...It is great big event for Canada." 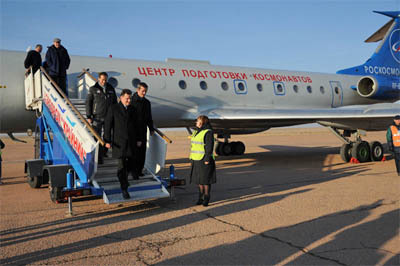 Over the next couple of weeks at Baikonur, the crew will climb inside their Soyuz capsule soon after arriving and again closer to launch for a series of fit-checks, perform some final training drills, exercise every day and spend time visiting with family before going away for five months. But throughout the launch base stay, Hadfield, Marshburn and Romanenko will be kept in medical quarantine to prevent getting sick before flight. "We don't want to get something as simple as a head cold, like JO Creighton back '90 and it delayed a shuttle launch. We need a quarantine, it's just smart after investing all of this time," Hadfield said. "But it's also a time to see our vehicle up close. It's sort of like a dress rehearsal -- we get into our spacesuits, we get into the vehicle, down into our seats and it's a chance to compare the real thing to what we've been training in the simulator, find out the things that are different than the sim, reach and touch and look at things." Hadfield, 53, was raised on a corn farm in southern Ontario, decided at just 9 years old that he wanted to be astronaut, became a pilot as a teenage and ascended to the rank of colonel in the Canadian Air Force. He flew aboard two space shuttle missions, visiting two different space stations in the process. His first spaceflight delivered a docking module to the Russian space station Mir aboard shuttle Atlantis in November 1995, becoming the first Canadian to operate the shuttle's Canadarm in orbit, and then helped install the next-generation Canadarm2 on the International Space Station aboard shuttle Endeavour's mission in April 2001, becoming the first Canadian spacewalker on that flight. He will be seated as the co-pilot aboard the Soyuz for launch and landing, assisting Romanenko in those phases of flight. "The training is incredibly in-depth. I spent one year here just going through the motion-control laws and the systems involved of the Soyuz. So you become incredibly familiar and competent in all of the systems and understanding exactly how that vehicle works. Then in the last year (of training) has largely been in the simulator, putting together all of those technical and theoretical things you learned and now making it all happen in the simulator," Hadfield said. Marshburn, 52, was born in Statesville, North Carolina, and earned a degree in physics and a masters in engineering physics before working on a doctorate in medicine and a masters in medical science. He was an emergency room doctor and a NASA flight surgeon until being selected as an astronaut, flying once aboard shuttle Endeavour in July 2009 that completed the Japanese laboratory segment of the International Space Station. He has 16 days in space and three spacewalks on his astronaut resume. Romanenko, 41, is a major in the Russian Air Force and the son of Soviet-era cosmonaut Yuri Romanenko. The younger Romanenko spent 188 days aboard the International Space Station in 2009 as a member of Expeditions 20 and 21 when the outpost expanded to the full six-person crew.